“ABAQAT” is an exposition of SATAAT & LAMAHAT of Shah waliyullah of Delhi. 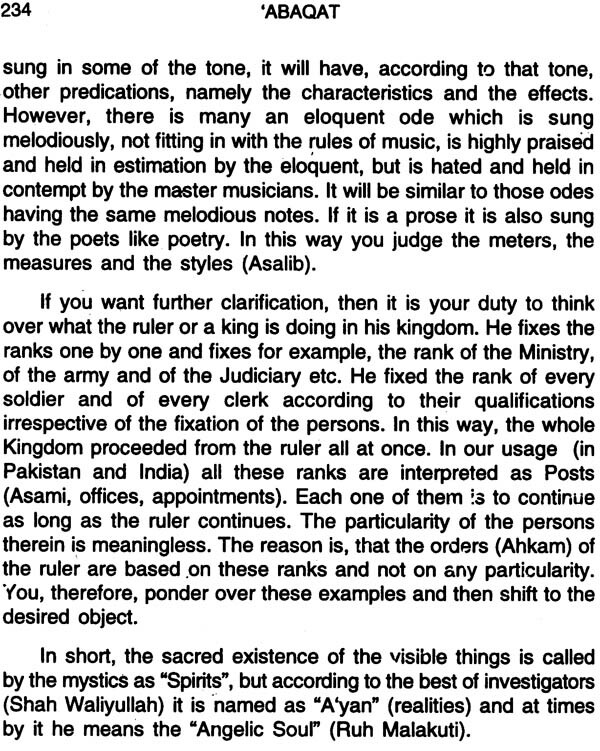 It is a reliable guide towards the understanding of the philosophy of Shah Sahib. The author has clearly shown where his grand-father has excelled the philosophers in general. It is indeed their lost thing, wherever they were to find it, it is their right to have it. In addition, the author has brought in some useful points he had gained through his personal experience. The study of this book is strongly recommended for persons having philosophical and mystical bend of mind. ‘Abaqat (Diffusions of Perfume) is the nearest source towards the understanding of the philosophy of Shah Waliyullah of Delhi. 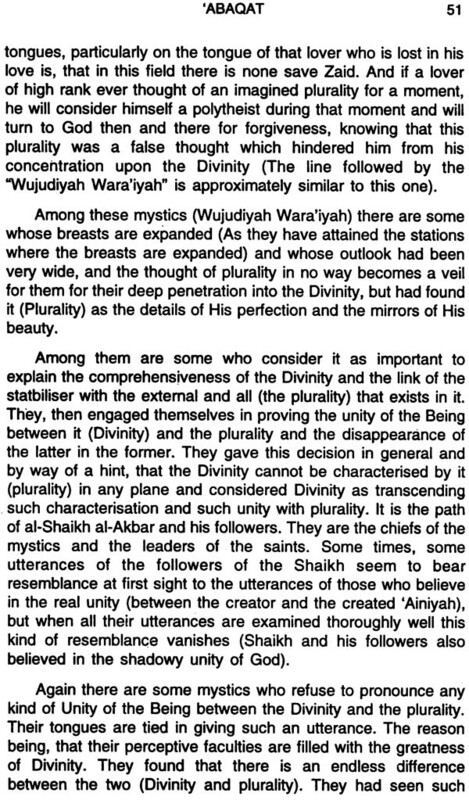 The author has attempted successfully at explaining clearly some of the mystical and philosophical points which had been summarily mentioned by Shah Sahib whom he rightly considers as the “best of investigators (Afdal-ul-Muhaqqiqin)”. He was deeply impressed by his two famous treatises ‘Lamahat’ and ‘Sata’at’ which cover two third of his field of philosophy. In consequence, he prepared his ‘Abaqat which more or less is an elucidation of their substance. 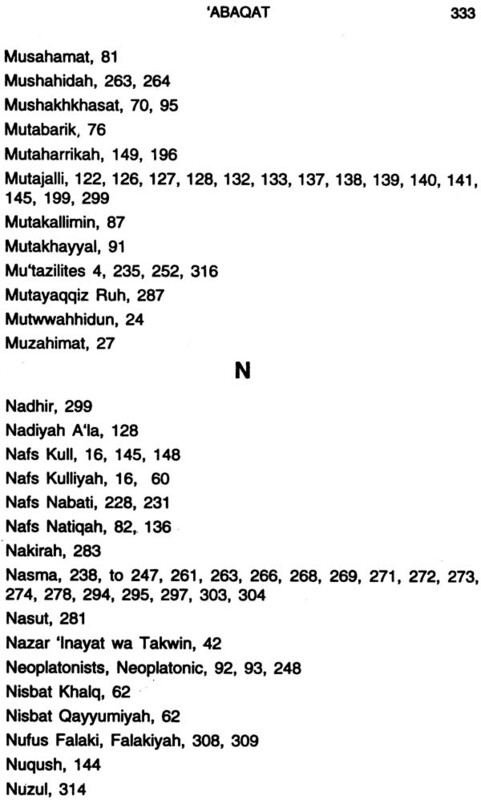 On the strength of these two works in particular, he has given preference to him over Shaikh Akbar Ibn-ul-Arabi and Imam Rabbani. Though Shah Shahid was not a. mystic but at times, the mystical revelations were made to him. His discussions on the esoteric science in his book are an indication to the vast knowledge he possessed about mysticism, philosophy and the traditional literature. He had written this book in the form of a text with an intention to follow it with a commentary but he did not live to do so2. This is the reason why it is difficult to understand certain points without elaboration. The translator had before him two Urdu translations of the ‘Abaqat, the printed one by Manazir Ahsan Gilani and the other in the shape of a manuscript once dictated by the late Maulana ‘Ubaid-ullah Sindhi in Mecca when he was in exile. If these translations had not been there, it would have been impossible for him to undertake such a hard task. Though this English rendering may not be claimed as completely free from defects, but in spite of that it will be found interesting and instructive particularly for the persons inclined towards mysticism and philosophy. Some months back, professor G.N. Jalbani wrote to me a touching letter, asking me to see the book in hand through Press, should he not live long enough to do so. The letter brought back the memories of the great kindness and interest with which Professor Jalbani taught Arabic to me and others like me in dire need of help inside the College, and later on at his residence. The deep reverence and respect that he inspired in his students did not abate with the passage of time. I recall in late 40s when I was a student of Professor Jalbani, he was working on his first book on Life and Thought of Shah Waliyullah. Patiently and persistently he continued to work in this field and the present book is a befitting crowning glory of almost 35 years hard labour. Professor Jalbani is humble and humane being. He has never blown his own trumpet. And I am sure he never will. He follows the foot-steps of the great Savants and Sages of Islam who taught more by their example than by words. I am quite sure all the students of Professor Jalbani share my sentiments and I fell privilleged to be wirting a Foreword to this eminently scholarly work of my teacher being whose student has always been a matter of pride for me. 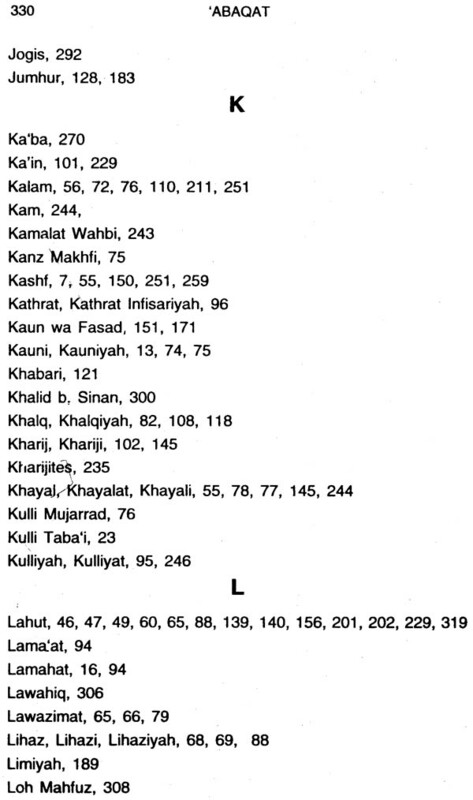 ‘Abqat is not an easy book to read, and is even harder to translate. It belongs primarily to the field of Epistemology, but from a strictly Muslim Sufistic point of view. At a point of time in history, when (till quite recently), the very definition of truth implied scientific verifiability, when validity of all religious statements was suspect because these statements by their very nature were not verifiable like facts in the field of physics and chemistry, when faith in God was almost identified with second rate Intellectual abilities, making available to an English reading audience the powerful and seminal work of Sayyid Isma’il Shahid, is indeed an act of courage. Till quite recently the Samantic-oriented philosophical writings of Wittgenstein and Bertrand Russell dominated the European and English speaking worlds of philosophy. However, it is only very recently that the intellectual spell of a theistically oriented empiricism is breaking, and works of philosophers like Stanley L. Jafii, Richard Swinborne P. Tillich and Whitehead have turned the secular empiricisits’ arguments against them. The contemporary new debates are about the ‘incoherence of disbelief. 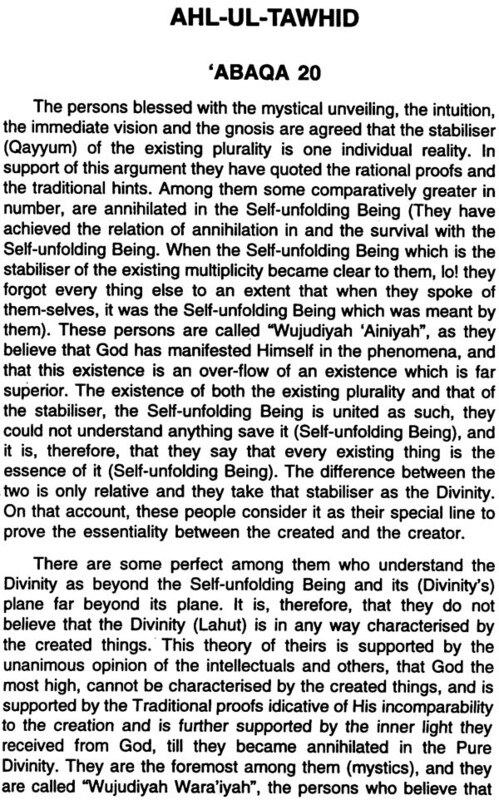 It can be asserted with full confidence that in a philosophical milieu, wherein theism is being affirmed with a new sense of confidence, and the limits set be secular and materialistic empiricism are being disregarded, works like ‘Abaqat’ have a double utility. On the one hand the author provides the reader an admirable insight into Muslim-Sufistic approach to epistemology, on the other he does not speak as a mere theoritician but as a practical guide in the Sufistic path. 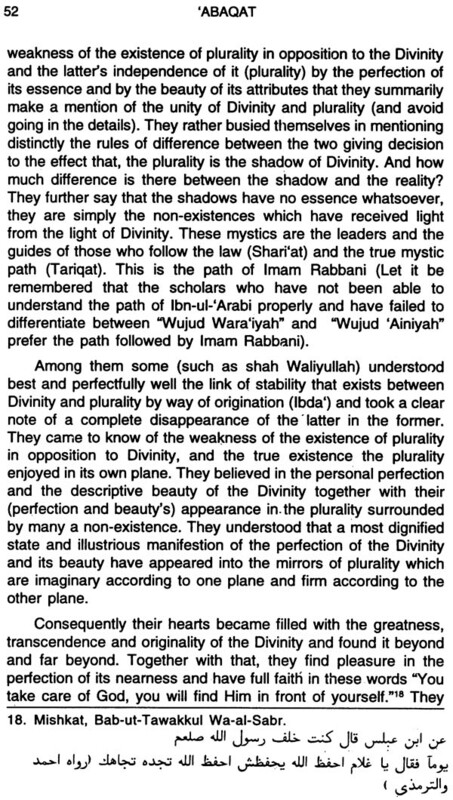 It should be recalled that Shah Waliyullah the acknowledged guide and mentor of Sayyid Isma’il Shah id had in his time tried to find a .common-ground for a new synthesis of the Wahdat-al-Wuiud of Ibn ‘Arabi, and Wahdat-al-Shuhud of Ahmad Sarhandi. ‘Abaqat is an exercise to proceed along the path lighted by Shah Waliyullah in his works Lamahat and Sata’at (both already translated by Professor Jalbani). For an audiance lost in the empiricism of the logical-positivists, and sexism of Freud and Freud inspired psychologists, ‘Abaqat’ will be a great eye-opener about what is ‘soul’ and what transpires within, about and above it. 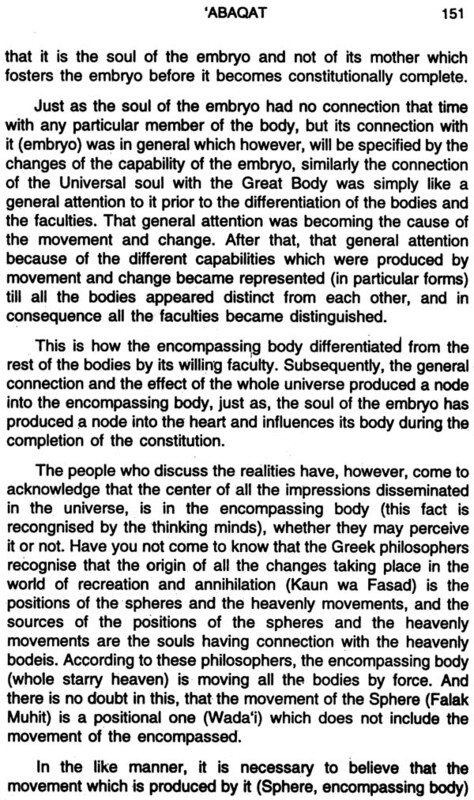 ‘Abaqat guides a person to identify the innumerable channels through which one who created and creates the universe which encompasses every individual, guides the human soul. 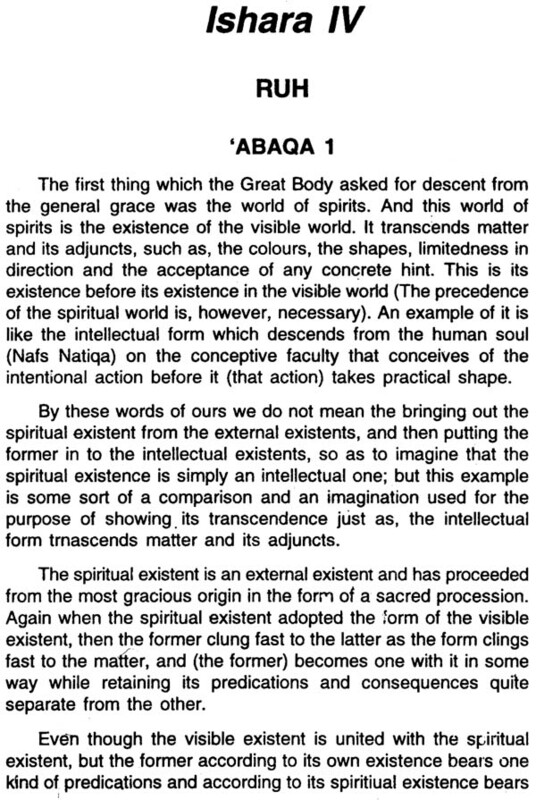 ‘Abaqat is a door to a new dimension of knowledge and therefore of existence. Time is ripe when the works of great but less well-known Muslim philosophers be brought forth before a developing international philosophical audiance. In Pakistan Professor Jalbani has performed a great service in regard to the family of Shah Waliyullah and its contribution in the field. 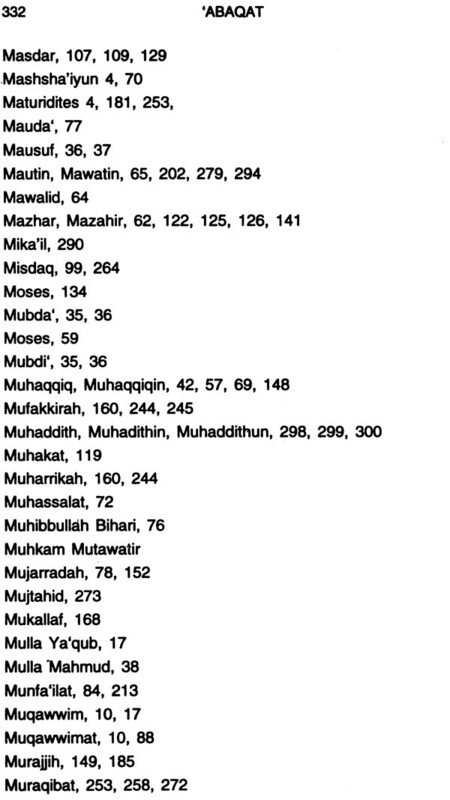 New studies of another great Muslim philosopher Mulla Sadra have also been done recently in Iran and U.S.A. The Farangi Mahal School in India stands in need of a new comprehensive introduction. Such excereises are necessary to belie the oft-repeated charge of Western teachers of Islamic philosophy that it had no genius of its own, and that it never went beyond a few commentaries on early Greeks. Upto Thomas Acquinas the West was no ashamed of liberally borrowing from Muslim teachers of philosophy and admitting this fact. Political and Military rise of Western States rendered the acknowledgment of this debt superfluous. It is only now in late seventies that it has been acknowledged once again that Scientific Development in the West took place not on the basis of denial of all religious, but on the basis of acceptance of the twin (Islamic themes) of religionality and contigency of the Universe (The Road of Science and the Ways of God by Stantely L. Jaki). Islam has a great deal to say to the people of Science. It is a pity that all those ‘ayat’ (signs) around us, to which Allah repeatedly invites our attention, tell a great deal to the scientists but not to Muslim scholars. No people according to Qur’an can really prosper if they forget ‘part of what they were taught’. Professor Jalbani’s latest work is a good and timely reminder, because the scientific world like the legal universe fall along the path of human soul its ascent towards the One and Only. 1. Acquisition through the perceptible object. 2. Shifting from the known to the unknown. 3. Receiving from the Unseen. The acquisition of knowledge through the perceptible object (Mahsus) is, that it is acquired through the particular form characterised by material accidents (such as lenght, height, time and place) and that matter of form is also present. This way of acquiring knowledge is called feeling (Ihsas). But, if the knowledge of the particular form is gained without the presence of matter, then that way of the acquisition of knowledge is called imagination (Takhayyul). When the particular form is not characterised by the material accidents, then that way is termed fancy (Tawahhum). 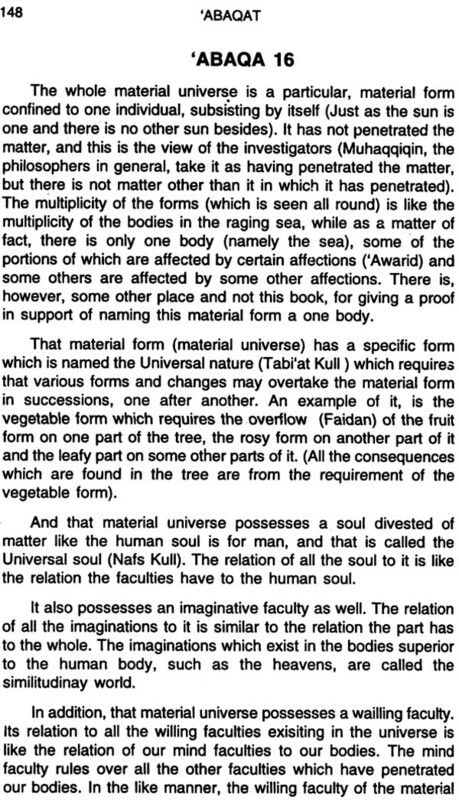 But if the particular is characterised by a universal form then it is called perception (Ta’aqqul). The judgments formed from the perceptive forms which were taken from the perceptibles are called the immediate perceptions (Badihiyat, self-evident facts). The shifting from the known to the unknown is, that if the process of shifting is gradual, then that is named speculation (Nazr) and the unknown is termed speculative (Nazari); but if the process of shifting is sudden, then it is named conjecture (Hads) and the result is called conjectural (Hadsi). 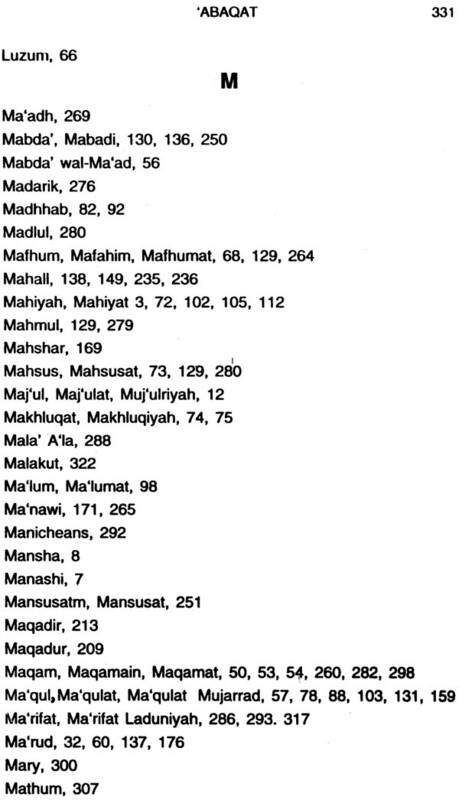 Acquiring knowledge by means of receiving from the unseen is of many kinds, such as, revelation (Wahy) occurrence (Tahith), instruction (Tafhim), taste (Dhauq), cognition (Ma’rifat), divine knowledge (‘llm Laduni), contemplation (Mushahidah), intuition (Wijdan) spiritual manifestation (Tajalliyat Ma’nawi), mystical unveiling (Kashf), attachment with the similitudinary world (‘Alam Mithal) and the external manifestations (Tajalliyat Suwariyah).· The detailed information which is gathered through intuition is called wisdom (Hikmat) and the detailed account gained through cognition is termed the science of realities (Funun Haqa’iq). Very soon a hint will be made towards the meanings of these technical terms. You better wait for it. All the forms of receiving from the unseen except revelation are called the mystical unveiling and the inspiration (llham). The revealed science (‘llm Naql) is one which is acquired through the information given by the sinless (Ma’thum). It is included in the speculative sciences (Nazariyat), because the acknowledgement of it depends on the fact, that it (information) has been given by the sinless, and whatever is given by the sinless conforms to the real. 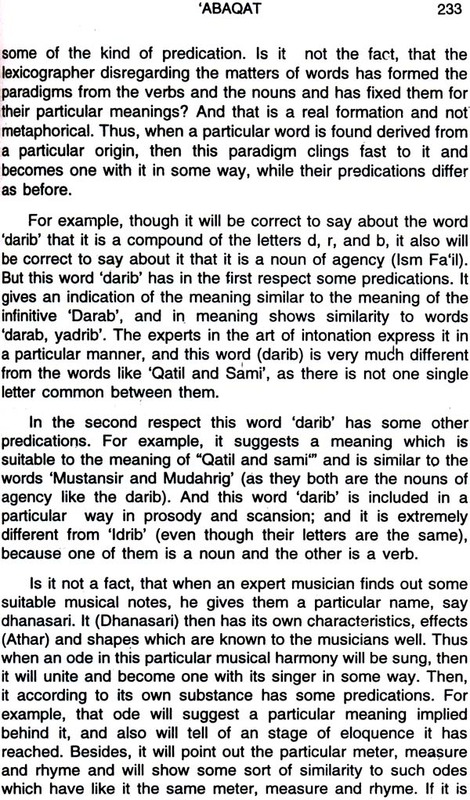 Thus, the things which are established by hearing (Sam’iyat, proofs to be believed on traditional authority) form the minor premiss (Sughra) of a syllogism, while the major premiss (Kubra) of it pertains to the deductive science (Istidlaliyat). But as the information given by the sinless is the source of a great number of sciences, it has been set apart from the speculative sciences and has been’ reckoned quite a separate science. 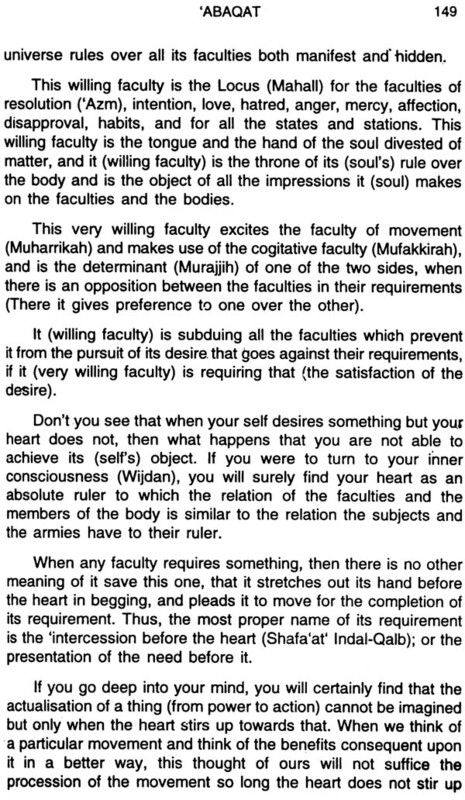 When the knowledge of the particular things acquired through the perceptibles and the knowledge of the immediate judgements (Qadaya Badihiyah) are not a sign of perfection for man to be taken into account, the people have excluded that form of knowledge which is acquired through various kinds of the perceptible, such as, the feeling, the imagination, the fancy (Tawahhum) and the immediate perception from those forms of knowledge which are worth consideration. By the death of the Holy Prophet, the seal of prophets, the process of revelation came to an end, and there did not remain any other form of receiving from the Unseen save the mystical unveiling; and here by mystical unveiling is meant its general meaning (which is applicable to all the kinds of receiving from the Unseen except the revelation). Thus, there are three means of gaining knowledge worthy of consideration. 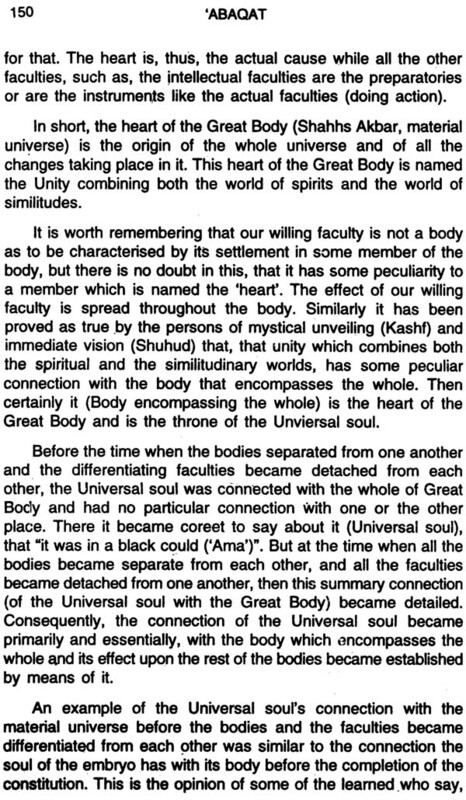 The first one is the perception and by it is meant the shifting from the known to the unknown, the second one is the tradition (Naql) and the third one is the mystical unveiling (Kashf). Let it be remembered that all these three means by which the knowledge is gained are not always free from one or the other defects. In the case of perception, the defect may be either in the form or in the matter of means which leads to the desired object. As for the tradition which is also a means of knowledge, the defect may be found at different places. For example, the transmission-chain which reaches the sinless may be week or the narrator may have committed a mistake somewhere or his power of retention was bad, or he may have been noted for fabricating the stories and some such other causes which are mentioned at their proper place or the mistake in the Tradition is made in this way that the speech (Kalam) may be diverted from its outward meaning without the presence of any context allowing such diversion. The defect in the mystical unveiling is, that it may be influenced by the devils from the Jinn and men or by the habits of the man of mystical unveiling or due to his inability, to encompass all the aspects of the mystery unveiled to him, The details of all this will be soon mentioned. When all these three ways are safe and free from causing confusion in their conveying the required knowledge, then there will be no opposition among them, or otherwise it will mean that there is an opposition even in the real and the actual. 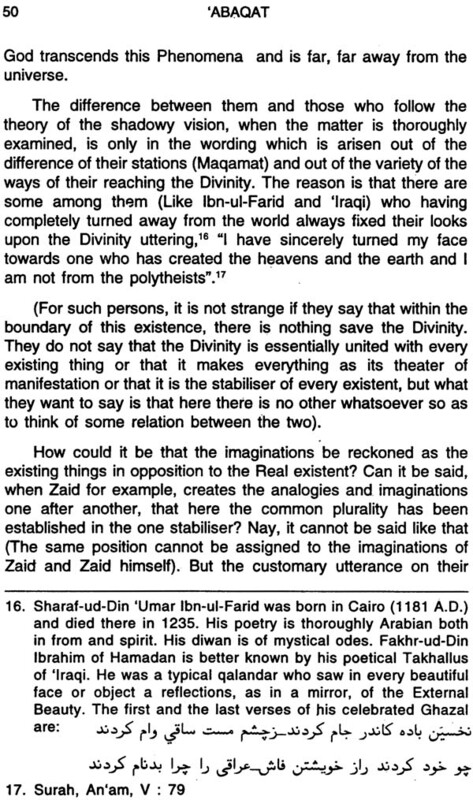 It is, however not possible that there may be any opposision between the convincing proof (Burhan Qati’), the unambiguous Tradition in an uninterrupted order (Muhkam Mutawatir) and the taste (Dhauq, Intuition) of the Sages (Hukama’). May be, some times, one of them be silent over what the other speaks on, but that is no opposition. Among these three ways, perception is one to which greater need is felt. The reason being, that no branch of science can become complete but by the use of conjecture and speculation. The knowledge which is acquired through the way of tradition is more strong in benefitting, and it is so, because, it is easy to take notice of or do away with the wrong things likely to find their way in it. Here the hope of gaining knowledge which is free from these defects is near, and the chances of confusion in it are rather slim. The circle of mystical unveiling is very vast, as it relates to the Unseen and the Unseen as is known is a treasury of infinite sciences. It is possible for him whose attachment with it is strong, to receive sciences which could not be acquired by any other person.